Over the past 30 days, you would have had to try pretty hard to avoid hearing about social media. New stories about Facebook's data issues seemed to pop up about once or twice a day—plus, there was a lot going on with channel updates, too! Let's take a look at the most important stories and updates social media marketers need to know right now. Since March 17, Facebook has been in the news pretty much constantly. That's thanks to revelations by a the co-founder of a data firm called Cambridge Analytica, who told the New York Times and The Guardian that the firm had illegally used data on over 50 million Facebook users to help sway the 2016 presidential elections. But what does it all mean for those of us who rely on Facebook to carry out our day jobs? There is a renewed interest in regulating Facebook and other online communities, and Mark Zuckerberg is scheduled to testify to Congress. Pinterest introduces algorithm-free "Following tab"
Described in the announcement as "a place focused entirely on the people and boards you follow on Pinterest," the Following tab is essentially an algorithm-free newsfeed—pretty much what every social network used to have before implementing programming that feeds you the content (and ads) it thinks you will want to see. This new/old take on the Pinterest feed shows you Pins in the order they were shared. The dynamic feed will remain the default, but now users who want the option to see things in order will have it. Pinterest-heavy social marketers should take actions to discover how much of its target audience makes that switch, but everyone should keep an eye on this, especially to see if platforms like Facebook and Twitter introduce similar options. The Following tab is available now on the web, and will be rolling out to the Pinterest apps in the coming weeks. Twitter no longer allows you to post duplicate content—either on the same account more than once, or by misusing multiple accounts. Where exactly is this coming from? It's definitely aimed at the people who are really taking advantage of Twitter, often using bots, and often with political purposes in mind. While we're sure you are not one of these people, the rules will still prevent you from, say, posting your latest blog in the exact same Tweet on multiple accounts. Posting the same content (aka "recycling") on a single Twitter account. ^Do any of that and your account may be suspended, terminated, or worse: expelled! Note: This scheduling ability was actually added to Instagram Graph API in late January. Since then, Hootsuite, Sprout Social, Buffer and others have announced features to take advantage of the new ability. Check out your favorite scheduling tool's news/help sections for more details. The announcement came along with the news that you can now use video in a Sponsored Content ad that will appear "directly in the news feed as a standalone post." This is a good opportunity to present a richer story on LinkedIn, whether as an organic Company Page post or a sponsored ad. 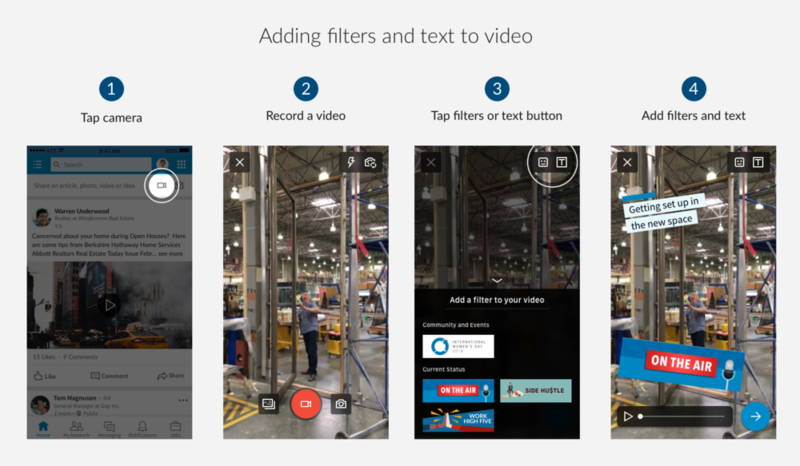 Anyone who has ever added filters, stickers or text to a Snapchat or Instagram Stories post will quickly see what's going on here. Now that LinkedIn allows native video posting (good!) they have decided to also give users the ability to overlay some basic stickers and text (meh?). We'll have to keep an eye on this feature to see how it expands in the coming months. We have seen how Snapchat's filters grew into a serious advertising game overtime. It's a little hard to see that happening on LinkedIn, but this may start to get some users feeling more comfortable with posting regular updates to the feed. According to this announcement, Pinterest's Shopping Ads (an advertising feature that integrates with existing product catalogs and creates interactive Pin ads) will be expanding to hundreds of businesses (compared to the current couple dozen, like IKEA and Lowe's). Businesses with an existing product feed can reach out to the Pinterest Ads team via this form to explore this opportunity. This spot is running during the Final Four. According to AdWeek, it's part of an effort to spread awareness of what exactly Snapchat "is" to the people who don't know (basically, people over age... 30?). The video's online announcement has a "Learn More" link pointing to a new educational microsite defining the company: whatis.snapchat.com. How to Brand Your Facebook Mobile Live Streams – This Social Media Examiner walk-through is a step-by-step guide to creating a nice banner for your next FB Live sesh. The Grim Conclusions of the Largest-Ever Study of Fake News – This article from The Atlantic shares "grim" findings from an MIT study, such as this: "Falsehoods almost always beat out the truth on Twitter, penetrating further, faster, and deeper into the social network than accurate information." Facebook Lite – Wired has the scoop on a new, slimmed down Android app for people who want to use Facebook with less data. (It's already been available for "people in the parts of the world where a mobile data connection is difficult to access, unreliable, or just painfully slow" but now it's being released North America, Australia, and Western Europe for the first time.